A simple and tasty sandwich perfect for the afternoon tea, evening snack or picnics. 1. Spread butter on 2 slices of bread. 2. 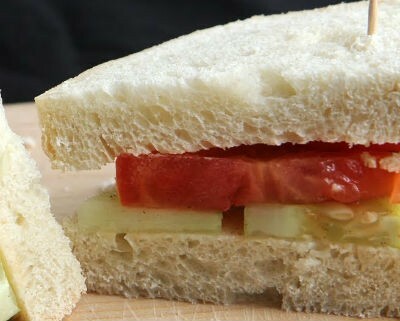 Arrange the cucumber and tomatoes on the bread slices. 3. Sprinkle salt, pepper powder and garnish with mint leaves. 4. Place the other 2 slices on top. 5. Cut into halves or quarters. Variations: Add cheese slices, red onions, mashed potatoes or lettuce if desired. Feel free to comment or share your thoughts on this Tomato, Cucumber and Mint Sandwich Recipe from Awesome Cuisine.